At first sight one can see this is an easy block. It has only 11 pieces and the layout is very straight forward. 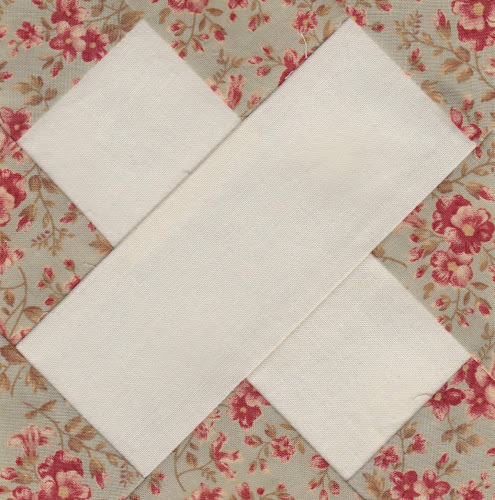 If you’ve never done paper piecing this is a really good and easy block to start with. I really like how this block turned out. I don’t know why but it’s pretty. Maybe it’s the fabric combination what makes it pleasing to the eye. I used just one 5 inch charm square for this block. 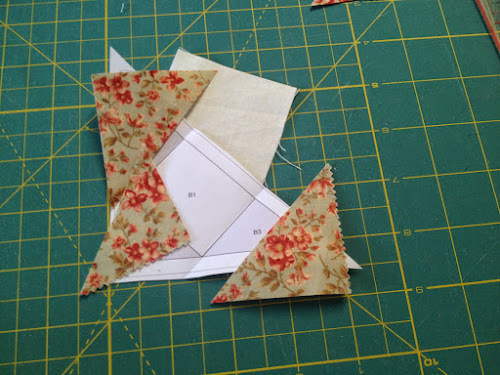 Cut the charm square in four 2 1/2 in squares and then cut each into a triangle. Print the pattern and piece away. Hi Teresa. Meanwhile I began my DearJaneQuilt too…. this block was my second one – cause it was so easy! I’m still afraid of all these curved blocks. 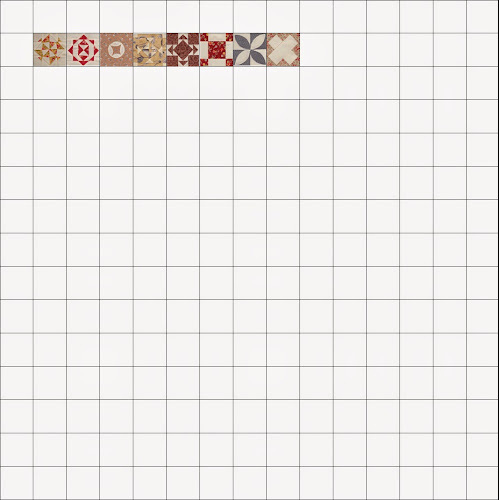 And I managed to create an own kind of virtual designwall – not perfect but ok. 🙂 Like the fabric you choose for your block. Have you an idea for a color scheme of your whole quilt or do you decide individual for every block? Love it! Happy Valentine’s Day from Virginia, USA! Happy Valentine’s day Susan. For the colour scheme I’m choosing fabrics randomly. I wanted to do mostly flowers and toned down colours as much as possible but I’ll see how I go.